One of my interesting tours with quite complex preparation. 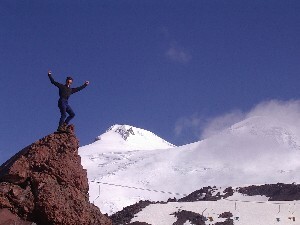 Actually this trip had two parts, journey itself and conquering Elbrus. Why journey? 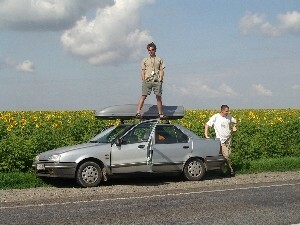 Igor, Štefan and me decided to travel towards Caucasus on ground, by car and this is one story. Traveling from our home to Hungerian - Ukraine border was nothing special, a little surprising was the fact that Budapest had no bypass road at the time and all the traffic - transit from west to east went through the nice city center. Beyond border was plane with poor small villages, after that the range of Carpathian mountains and behind them about 2500 km slightly wavy country all the way to Caucasus. 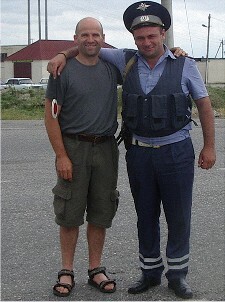 Border crossing Ukrain - Russia. Three hours of patience managing bureaucrat stuff and we were in ex superpower of the world. One can not believe. 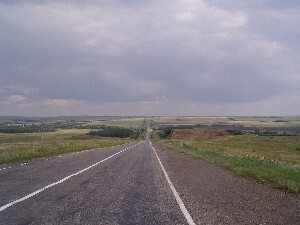 The route from the border to caucasian country Kabardino-Balkaria, where Elbrus is located, led us past the city Rostov on Don and passed without any turbulence. 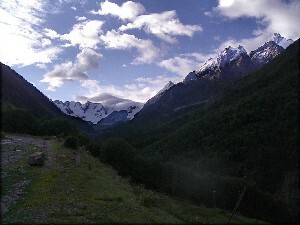 Kabardino-Balkaria lies in the proximity of north Ossetia and little less near Chechnia. 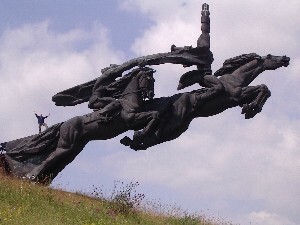 A part of turbulent Caucasus therefore. 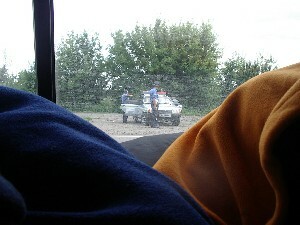 We didn't observe any disturbances or riots, only the police was more annoying as before on the whole trip. In the distance of 100 km we came upon four control points and everytime we were left with little less euros, despite all the possible tricks we had. We were terorists, defilers of the second world war memorial, we were driving defective veicle, we had faulty documents... Everytime we were threatened with prison but five euros usually made us "friends". 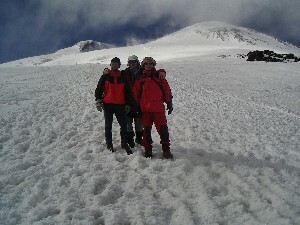 The fourth day we arrived under Elbrus. We accomodated ourselves in an appartement rented to us a by a good-natured madam Maja, that facilitated our staying in the town Treskol under caucasis mountains. Then we did acclimatisation and ascent to the mountain which having 5642 m of altitude dominates above its rather inaccessible neibouring mountains. 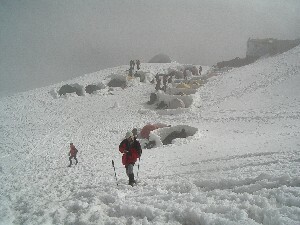 Elbrus isn't technically difficult mountain but nevertheless it takes a lot of will to get to the summit. 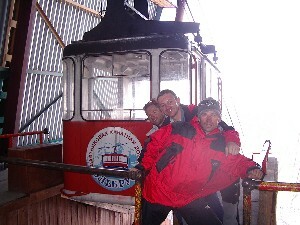 It is obediantly raising from 3800 m up till where one can come with cable car. 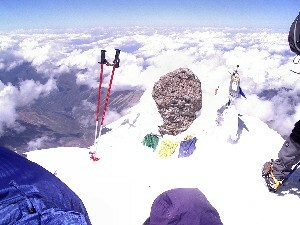 The key of the ascent is traverse on 5300 m, that is going infinitly towards the notch between east 5621 m high and west - main summit 5642 m. Here it is mostly important to have will, stubbornness and readiness for the high altitude (acclimatisation). 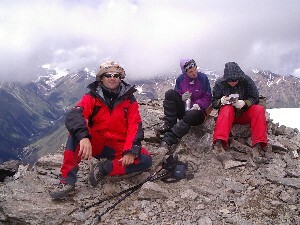 All the three of us have done the summit, deficient acclimatisation reflected itself but desire to reach the top was too big and we didn't want to miss the period of nice weather. Later we made also a trekking through the valey Adylsu with ascent to summit Andyrchi 3913 m and found out that this could be the perfect acclimatisation tour next time. 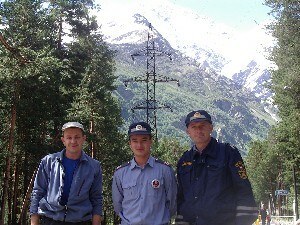 After eight days in Caucasus we had in front of us a journey back home. On the way we visited city Azov, where nearby river Don flows into the Azov sea. 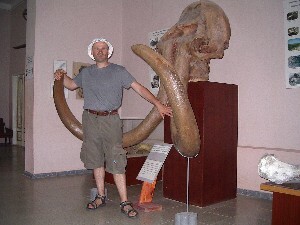 In the city we saw an interesting museum of extinct dinosaurs, we bought some authentic russian souvenirs (Matjuška, vodka ...), rested a little and we were ready for the long way home. Few words about the simple people there. I must say we had no bad experiance. Locals were friendly and always helpful - I will always be happy to go back to these parts with Slavic souls. The story is in us and nothing can wipe it out. 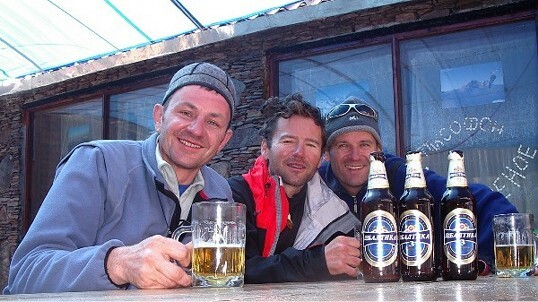 We became true friends through all adventures on the road and on the mountain.